We’re clear in the swing of Fall and it’s been a beautiful few weeks! What better way to celebrate the change of seasons than with a quick and easy kitchen make over? 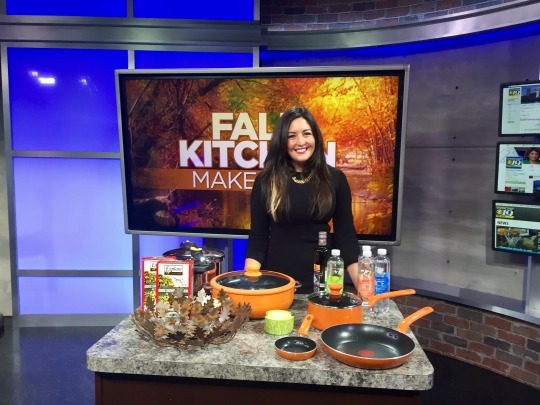 Check out my Fall kitchen makeover suggestions with WOIO in the morning – full product list below! Imusa Caldero: A great multi-purpose stove top pot! Serve up pastas, stews, rice or a roasted chicken. The silicone rimmed lid helps keep steam sealed in. Imusa Pressure Cooker: Cut down cook time by 70% for pot roasts, soups, rice or even hard boiled eggs! T-Fal Cookware Set: In Excite Orange! This set also has Thermo-Spot, a patented technology to show you when your pan is perfectly preheated. Oak Leaf Bowl: From Ten Thousand Villages – great for fruit or a bread basket. Orchard Tree Coasters: Also from Ten Thousand Villages, festive decor or a great host gift. Sparkling ICE Essence of Water: Great as a stand alone beverage and perfect for a cocktail mixer. Explore Cuisine Edamame & Mung Bean Fettuccine: Gluten free, non-GMO and organic! A nice alternative to wheat pastas. Do you change up your kitchen based on the system? If so – what do you do to spruce it up?